Discover a premium coffee experience with NESCAFÉ GOLD BLEND. Contains mountain-grown Arabica beans ground 10 times finer. Savour the smooth, well-rounded taste of our recipe. A quality instant coffee for all coffee-drinking occasions. Enjoy memorable coffee moments with NESCAFÉ GOLD BLEND. 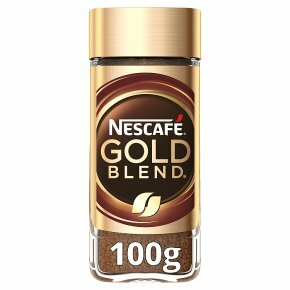 NESCAFÉ GOLD BLEND is a premium instant coffee with a smooth, distinctive flavour and rich aroma. Our recipe contains mountain-grown Arabica beans ground 10 times finer, to unlock the soul of the bean. So prepare a cup, sit back and savour the moment with this quality blend.